The wonder of astronomy is only bettered with quality gadgets and equipment. There’s a whole world of them out there, which ones will assist you? 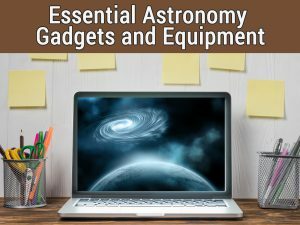 In the following article I’ll go through the most important astronomy gadgets and equipment to have in your stargazing arsenal. These gadgets will improve the quality of your hobby and could open up entirely new areas to explore. Astronomy is a hobby where spending money is easy. Finding the right quality equipment to spend it on is a different matter. Make sure that you take the time to research what you need from your kit. Take part in forums, read reviews and, if possible, take some kit for a test ride in a local store. I thoroughly recommend investing in items similar to below. You won’t necessarily need to purchase them all in one go! Have them all in your kit and you’ll have the whole universe in reach. Also dont forget to go through some of the related posts. Not so much a gadget, more the core of your equipment. The mantra here is to buy once and buy right. Research properly and be sure to invest in the appropriate telescope for your needs. Or Visit our Astronomy guide to see whether you want to go for a binocular or a telescope? Some telescopes are now fully automated with onboard computers and small motors to track the night sky. The best will link to the cloud and take you on a private celestial tour depending on your local conditions. Thanks to their portability, a pair of astronomy binoculars will sometimes suit better. You’ll naturally be spending a lot of time in the dark. In fact, the darker the better. There will come a time when you’ll need to see and this is where the flashlight comes in. It is worth investing in a torch with a red light. Why a red light? This style of light doesn’t force your eyes to adjust so much whilst still letting you find your way. This means you’ll be back to exploring quicker. A head mounted version will allow for even easier access. As everything goes more and more digital, therefore requiring electricity, you’ll need to plan ahead with your charging. Inevitably there will be those nights where power starts to run low and you don’t want to be left in the dark! Some power banks are great for charging USB style items. Invest in bigger, more heavy-duty power banks and you’ll be able to run your laptop and more from a 120AC inverter. Bear in mind that these aren’t easy to carry! Let’s face it, there are some nights where going outside just isn’t an option. Who says that you can’t carry on with your hobby? Turn down the lights and fire up your own personal galaxy. You can lay back in the comfort of your own home and still enjoy the night sky. As technology develops and improves so too will the astronomy gadgets and equipment made available to us. Let’s not forget that the Apollo missions were flown with less computing power than that of your smartphone. Keep researching, keep learning and keep on enjoying.